My family told me that they don't know what I do for work. This was kind of surprising since everyone tells me that I never shut up about what I'm working on. This post is an attempt to explain what I do/did as a "Pre-Sales Engineer". I've played this part while working for software or hardware companies that sold "technical" products. These ranged from Logic Analyzers and Embedded development tools to development and application platforms to Internet support products like web and mail servers. Note: I'll probably use "Field Engineer", "Sales Engineer" and "Pre-sales Engineer" interchangeably throughout this document. A Pre-Sales Engineer has the rare skill of being comfortable with technology and with people. Pre-sales technical resources explain technology to techies, implement a solution, map the benefits of technology to business problems and interact with business users and managers.. Pre-sales Engineers are nerds who can talk to non-techies without killing them with jargon. Sales representatives own the account. They are accountable for the team's success and carry most of the financial risk associated with account performance. 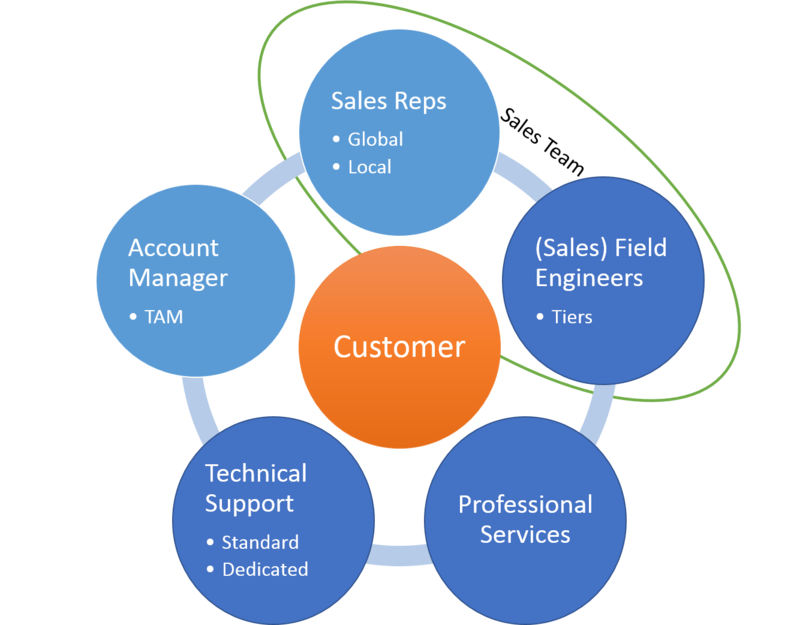 Sales representatives handle the higher level customer relationships, track deals and handle first level technical discussions with mid to upper level management. The Pre-Sales Engineer is the technical half of a sales team in a partnership where the sales representative is in charge. PSEs must be "sales ready" while also having good technical skills. Pre-sales engineers tend to handle the technical relationships and 2nd level product discussions. Pre-sales technical resources exist to help the sales process. They exist to help close the deal and make the next deal possible. Companies sometimes also use field technical resources to help cement technical partnerships with organizations that can help bring in future business. A company may spend technical resources on a systems integrator or reseller to enable them to bring in business on some channel. Ex: higher education, government, etc. Sales engineers can be inside or outside. Inside sales teams tend to work smaller accounts or external companies that aggregate other smaller accounts. Their customer interactions are all online/remote. Inside teams may handle sub-parts of larger accounts. Outside sales teams are expensive and tend to focus on larger or strategic accounts. Outside teams do digital meetings but also travel for in-person events. EX: All of pre-sales technical resources for a large on line bookseller and cloud provider worked inside until a couple years ago. It was only after they started getting true enterprise or government type deals that they spun up an team that was more outside oriented. I've always worked outside. Pre-sales engineers own the technical side of the sale. "Own" can mean a bunch of things depending on the complexity of the technology, the seniority of the engineer and the trust level and technical expertise of the sales rep. Essentially the engineers job is to understand the business problem , map that to the technical product to provide a business solution and to overcome technical objections. They help package/re-package products and services to meet the customer needs by using previous solutions and customers as examples of how the solution comes together. Pre-sales activity involves initial calls, live meetings, webinars, discussions with the sales rep, customer presentations and product demonstrations. PSEs create customized presentations and demonstrations that target that customer's needs. These can be minor customization or major amounts of work based on how far along this is in the sales cycle and how important the deal is. Good sales reps do a pre-meeting walk through for every meeting to make sure the team is on the same page as far as goals and to make sure everyone understands what is known about the customer. There are also follow up conversations after each meeting/call to make sure everyone heard or saw the same thing. Many PSEs work on multiple teams with different operating styles. PSE resources are expensive so they may be pooled with multiple reps or assigned to specific reps. A sales team may have dozens of calls per week with overlapping meetings and discussions. The PSE is responsible for keeping track of where each sales process is at and what tasks needs to be done. RFP responses often also fall on the PSE. No product is an exact match for a proposal unless it was written explicitly for the product. In either case, it is up to the PSE to help craft a response that describes how the product meets the request as much as possible while mentioning advantages that may cause the request to be re-defined. This is hard for many technicians who tend to very direct and literal in their interpretation of requirements or specs. Sales reps like to retain control over activities because they are the ones rewarded for success and accountable for failure. PSEs can operate semi-independently handling customer calls , questions and presentations at the sales rep's direction. The amount of power given to a PSE is directly proportional to the trust the sales team has that the PSE understands the product, won't say anything stupid, knows when to be quiet and understands the products the sales representative's style well enough to be and independent contributor. 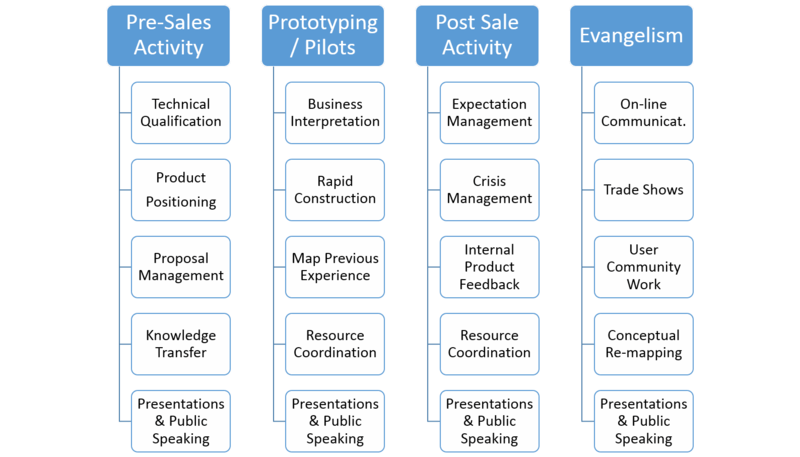 Many sales processes have a "bake off" or prototype phase where the customer wants to see the product in action in their environment or targeted at their business or problem space. Prospects use these to verify the functionality or to try and eliminated companies to shrink down the amount of choices they have. These events tend to be on short time lines. Product companies often try to get the customers to pay for part of these efforts to make sure they customers are serious and to make sure they have "skin in the game" with respect pushing to a completed state. Pre sales engineers are one of the few resources totally controlled and "owned" by the sales group. This means the sales group will often augment paid PoC efforts or completely fund them out of the sales team using the Pre-sales engineers. Pre-Sales Engineers must know their products well enough to scope and develop small implementations as part of these efforts. This can be a very technical event depending on the complexity of the product being demonstrated. PoC efforts need to be done as quickly as possible in a "good enough" fashion that satisfies the customer's meaningful requirements. They SE may have to figure out the most important areas based on feedback from the customer's various stakeholders. The business may want to see one thing, technicians another and finance or operations a different area. A PoC is not delivering a production ready environment. It is delivering enough that people can see the end state or that something will work. These are high pressure events where the sales team may often also expect the PSE to continue handling other sales issues for this or other customers. I've seen people working out of their hotel room at night while travelling to other customers or a trade shoe. Expectation management with respect to time commitments and deliverables are keys to success in PoC efforts. Primary customer support is usually handled by product technical support, post sales consulting teams or account managers. The sales team often retains control of the account but only gets involved in post-sales issues as part of ongoing sales opportunities. PSEs sometimes help with planning for initial implementations or act as second tier or "on site" support if the primary technical resources can't resolve an issue. There are many situations where a company or it's products must be positioned, demonstrated and described that are not tied to an individual sale. Trade shows, marketing webinars, user groups, departmental technology demonstrations and partner events often require PSE support to give presentations, do demos, participate in panel discussions, answer questions or do basic training. These types of events let the company get in front of more prospects without having to visit each one individually. Some companies have technical marketing, developer evangelism or outbound technical publicity groups that handle the bulk of this work but they usually still rely on remote field resources for staffing. PSEs may also be called upon to create the scripts or demonstrations and demonstration environments for these events. 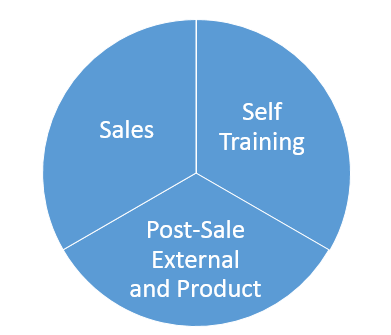 Many technical sales organizations have multiple levels of PSE. There is often a step-up tier for more senior folks that are called in after the initial work is done. These may be Subject Matter Experts for particular products or vertical markets. A SME may be an expert in video or key cards for a security company. A vertical market may be a specialty, like finance, medical, government or some other area that has special needs and standards. The actual breakdown varies by product an industry. My experience feels something like that to the right. Some folks mostly do proposal respnses. Their time breakdown is probably completely different. Sales: True sales activity including presentation prep, meeting prep, actual customer communication, and deal planning. Self Training: PSEs must become experts in their products which involves a lot of self motivated training. They also self-train while building demonstrations and doing PoC. Post-Sale: Customer satisfaction leads to future business. PSEs have direct customer involvement and advocate for the customer themselves or for customer requested product changes. PSEs also maintain technical contact with the customer while the sales reps prospect for new deals. Sales representatives are different beasts. They think differently and are motivated differently that most of their technical counterparts. They believe products are a good fit when the PSE doesn't quite see that (yet). They ignore or work around objections that may seem fatal to a technical person. Sales reps can be compensation driven because they accept the risk / reward balance of commission based compensation. Good sales representatives understand how to drive a process and understand how people think. I have found working with sales reps to be a generally rewarding experience. Hunters: These folks tend to be more aggressive tracking and bringing down the big deal. They are often great in a startup or when a company is trying to make a name for itself. Hunters are not always great as account managers or annuity builders. Sometimes you will run into a hunter that is a true barbarian whose first instinct is always to pick an aggressive sales posture. Farmers: These tend to work longer term deals, sometimes forgoing short term opportunities if they feel the product or customer isn't really ready. Farmers can take a beating inside a company because they may not force close deal on short timelines. Companies tend to use these folks for relationship management and for customer satisfaction. Sales representatives are usually commission or quota based. They will also occasionally bend a deal to better fit they way the company structured quota or bonuses. That's one of those things a technical person has to learn to live with. Customer visits have a dress code. Technicians may not think appearance is important but first impressions and dress do matter when dealing with customers. Technical folks tend to take a question literally and answer it assuming there is a "right answer". They need to understand the real purpose of the question. Sometimes the question is more of a "how do we use your product to do it the way we used to" when the answer needs to be "this is how you solve a business problem a new way". Sometimes folks ask hard questions as part of a "stump the chump" contest. PSEs need to handle that too. A lot of early technical questions exist to winnow down the number of vendors they need to talk to. Technicians need to be aware of this and not say "no" until they have to. Technical folks tend to provide short answers when the answer is "yes". They tend to provide a long winded response when the answer is "maybe" or "not exactly". All answers have to be given within the context of the meeting and the place within the sales pipeline. This is something people folks may need coaching and training to learn to handle. Technical folks also tend to be specific when they know the answers but very fuzzy when they don't. This improves as the person learns more about the product, features and customer business processes. Sales representatives and their management often operate on a quota system. This may drive the teams planning and thinking during certain times of a quarter or year. A sales rep may view the likelihood of a deal based on size or product mix where the PSE may view it based on technological match. Customers sometimes are experts and sometimes don't even know the basics. This may happen in the same meeting. PSEs have to adjust to these disparate expertise levels. My experience tells me that corporations train their PSEs more aggressively than about almost any other technical position. PSEs need to understand products and techologies well enough to explain it to others, to demonstrate in high pressure situation and build small PoCs or deployments using the technology. Companies, like VMWare, push PSEs through rigorous certification processes before letting people in front of customers. Training has to be done in a hurry so the PSE is useful but very deep so the PSE has credibility with the people they are in front of. Some times this is like drinking from a firehose! Pre-sales engineers tend to make more than their developer counterparts. Companies pay extra for people who both understand technology and can communicate with technical and non-technical humans in high pressure situations. I'd guess that pre-sales engineers make about 20% more than their inside engineering counterparts. They also normally get a performance bonus on top of that. My experience has been that sales-engineers get about 80% base and 20% bonus. Sales representatives can be the inverse of that. Many pre-sales engineers move to sales but many are more risk averse and stay more on the technical side. hey people i need some help here regarding pre sales profile as I have just entered it.Can anybody help me out ?